HOUSTON — Gravity, get ready to meet your match. A team of students is counting down to light zero-gravity fires high in the sky today (July 18) aboard a jet plane designed specifically for weightless flights. After months of preparation, eight engineering students from the University of California, San Diego are set to fly with NASA's Microgravity University today to test how biofuels burn in weightless conditions. The UCSD Microgravity Team is one of 14 groups of college students and teachers flying weightless missions with NASA's Microgravity University this week. Today's flight will ride aboard G-Force One, a jet owned by the Zero Gravity Corporation that offers brief stints of weightlessness by flying up and down on a parabolic trajectory. Members of the University of California, San Diego Microgravity Team wait with their biofuel fire experiment apparatus ahead of a weightless flight as part of NASA's Microgravity University Program. Image taken July 17, 2013 at Ellington Field, Houston. They are: (clockwise from top left): Jack Goodwin, Victor Hong, team leader Sam Avery, and Daneesha Kenyon. The flight will take off from Ellington Field near NASA's Johnson Space Center and head out over the Gulf of Mexico to perform include 32 acrobatic parabolas. Each downward plunge should provide about 30 seconds of weightlessness that will be countered by stints of "hypergravity" when the aircraft pulls 2Gs (twice the force of Earth's gravity) on each upswing, NASA officials said. NASA's Microgravity Program is making four flights this week between July 12 and 20 to give all 14 teams a chance to perform their experiments. "They'll be testing everything from the way oil and water behave in microgravity to the way light reacts in microgravity," explained Frank Prochaska, NASA's reduced gravity flight program manager for student campaigns, in a July 12 interview. 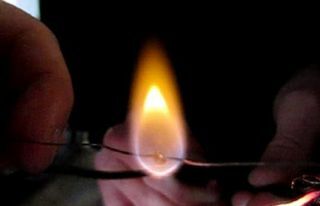 The UCSD Microgravity Team is testing how biofuels burn in weightlessness by using a syringe to squeeze the fuel onto two crosshair-like wires, then igniting the mixture via a remote control box outside the fire chamber. Inlet and outlet ports mounted into the boxes sides should vent any excess smoke, Avery said. The team will write a report on the experiment's results and hope to glean insights on how to better protect astronauts and spacecraft from in-space fire events. In addition to Avery, the UCSD Microgravity Team includes aerospace engineering students Andrew Beeler, Jack Goodwin, Victor Hong, Daneesha Kenyon, Josh Sullivan, Joshua Siu, Joshua Sullivan, and mechanical engineering student Nico Montoya, with their NASA mentor Christina Gallegos rounding out the crew. With the exception of Sullivan, who has graduated, all of the students are upcoming seniors. Beeler, Montoya and Siu serve as the team's ground crew, while the rest are scheduled to fly in shifts during two of the research flights. This reporter is assigned as UCSD's official team journalist for today's flight, which is the first of the two trips. Stormy weather over Houston and the flight range used for NASA microgravity flights has caused some delays for the weightless missions this week. The UCSD team initially planned to make its first flight early this morning, but the weather delays have pushed their mission to the afternoon. Montoya said he was surprised to learn that bad weather could pose a serious threat to the team's chances of flying. "That's a big worry right now," he told SPACE.com. Avery said he's always had a strong stomach. To practice for the flight, the entire team took a trip to Pleasure Pier in nearby Galveston for a rollercoaster ride. Avery ate an entire funnel cake and then rode a rollercoaster to see if he might get sick. He didn't. Goodwin also trusts his stomach and said he grew up near the ocean and spent a lot of time on boats. He also wanted to make sure he avoided any drowsiness that might crop up from the anti-motion sickness medications, he said. While the UCSD Microgravity Team is dedicated to collecting good data from today's weightless flight, the students are also hoping to take advantage of their rare chance for a zero-gravity flight. They created a large team banner to display behind their experiment and hope to create their own zero-gravity music video set to the tune "The Scientist" by the band Flux Pavilion. "The first line is 'I still wanna be a spaceman,'" Avery said. "And we thought that made sense." NASA's Microgravity University is one of several agency programs designed to enable access to weightless flights for students and researchers. The agency's Reduced Gravity Education Flight Program oversees the Microgravity University, as well as the Teaching from Space, Systems Engineering Education Discovery (SEED), and other related programs. Editor's note: You can follow the progress of today's NASA Microgravity University Program flight via the program's Twitter feed @NASA_RGEFP and the hashtag #DefyGravity. UCSD Microgravity Team member Nico Montoya has been posting updates about the team's work at @NicoSuave9. Email Tariq Malik at tmalik@space.com or follow him @tariqjmalik and Google+. Follow us @Spacedotcom, Facebook and Google+. SPACE.com News Editor Megan Gannon contributed to this report. Original article on SPACE.com.